You can&apos;t always trust strangers on the Internet. And then it started getting weird. Whenever you get a group of people together, there tends to be drama; and if anything this is exacerbated when the group is gathered in cyberspace. Not everyone is what he claims to be; not everyone sees him or herself as others do. Most people are honest, straightforward and savvy; but some people do have agendas, some lie, and many are gullible or, at least, naïve. And cybergroups, such as the Abduction Support Group I started in 1992, on the CompuServe "Encounters" forum, are no different. In fact, possibly because of the nature of the subject at hand, some of the dramas were particularly wild. To appreciate what I'm about to share, you need to understand how CompuServe forums were organized. Each was the equivalent of a modern Internet bulletin board or forum site such as PumpkinDriver.com or Writers.net. 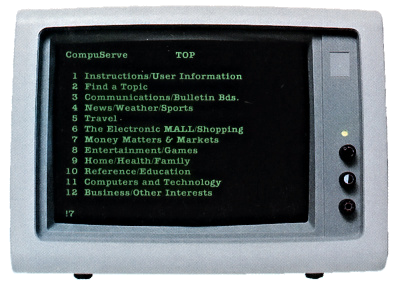 While the forums were hosted by CompuServe, they actually had owners; "Encounters" was originally owned by the TV production company responsible for the television show of the same name. It was divided into separate sections with names such as "Ghosts", "UFOs", and so on. Each section had a Section Head, a person who had the ability to edit and delete posts (not often exercised) and who, in the case of the "Encounters" forum, often acted as den mother to visitors who had sought it out because of some terrifying experience they'd had. There was also a SysOp (short for "System Operator") who managed the entire forum, and even one or two assistant SysOps at various times. *All names have been changed to protect the members' privacy. Shortly afterward, we got a couple of other new members. One was Danny* and another was Sylvia*. Eric, Danny and Sylvia were often online at the same time and apparently lived in different parts of the country. Danny had the interesting career of hand-making custom-designed teddy bears in addition to his day job (actually, night job) as security guard at a Massachusetts electric power plant. Sylvia was a secretary somewhere in the Midwest, and Eric actually worked full-time as a CompuServe SysOp. (He handled several other forums in addition to Encounters.) He lived in North Carolina, not far from Nag's Head. I lived in New Hampshire but was working all across the country as a computer programming trainer, and when I got a class scheduled in Charleston, South Carolina, I decided that instead of flying I would drive. This would give me a chance to visit my kids in Virginia, my abductee friend Ann in Connecticut, my sometimes-boyfriend Ray in New Jersey, and—I was really excited about this—Eric in North Carolina. I rarely got to meet members of Encounters in person; besides, Eric had recently confessed to me he was gay and had posted a photo of himself. He was really cute, and I'd enjoyed the conversations we'd had online, so I thought, y'know, who knows—maybe Eric would turn out to be "the one". I talked it over on the phone with my friend, Holly, another abductee I'd met in Encounters. She's very psychic, and I trusted her intuition. "I don't really see that happening," she confessed when I admitted my crush on Eric's picture. "But I think it will be an interesting visit." She wouldn't comment further. As I packed for my trip, some excitement hit Encounters. Danny, the teddy bear guy, had unexpectedly encountered an alien while at work! Even better, Danny'd had a Polaroid camera with him and gotten a photo. A second photo, he said, had been taken by an automatic camera when its motion detector was triggered. He posted them for us to see. I've mentioned that abductees are psychic. One of the side-effects of that is that most of us can see auras. Actually, one person in twelve can see auras anyway, without any special training or talents. Those people usually don't realize they can see anything that everyone cannot. The thing about auras is, they surround living creatures and can even be detected in photos. 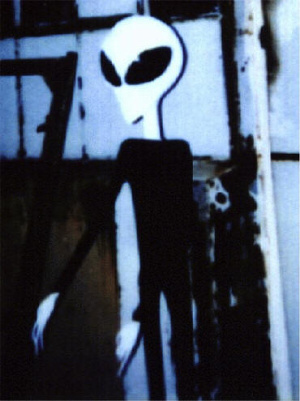 Yet, none of us saw an aura around the alleged alien in these pictures. To us, it looked like a plastic manikin. The theory was proposed that the creature was wearing a skintight environmental suit; and perhaps it was. Perhaps such a suit, of alien origin, might even suppress or hide an aura. In any case, the photos gave me something to think about as I drove southward from New Hampshire. Just before I left, I called Holly to let her know I'd be offline for a few days. I mentioned Danny, and she said, "Oh, dear. Did you know he sent me a teddy bear?" "Really!" I wasn't sure how to respond. "As a gift?" "I guess," she replied. "I wasn't expecting it. I got home, and here was this package on my doorstep from someone whose name I didn't recognize." I was confused. "You mean, his name isn't Danny?" "It is, dear," Holly explained. "But I'd never seen his last name and he didn't tell me he was sending a package so I didn't connect it with him. Besides, this was postmarked from North Carolina. My first thought was that it was a letter bomb. So I doused it with water and opened it outside the house with a stick." 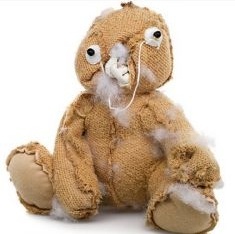 "But it was just a homemade teddy bear," Holly continued. "Except…it's really homemade, if you know what I mean. I don't see how he could ever sell any of these." "Oh." Danny now seemed like a really pitiful character, some poor shmuck who would fall for a woman he'd never met and send her a poorly-made teddy bear to try and impress her. "But why was it mailed from North Carolina? I thought Danny lived in Massachusetts." "I don't know," Holly admitted, making me promise to call again after I'd met Eric. "I want to know everything, dear!" We said goodbye and I set out on my way. Three days later, I was in North Carolina. Eric had given driving instructions to a restaurant that was on the main road near his home. I arrived at the beachfront community just before six in the evening. I called Eric's number from the pay phone in front of the restaurant, expecting to get directions. Instead, he insisted on coming by in person. "My house is really hard to find," he explained, adding, "By the way, that picture of me I posted on Encounters? Well, I'm now a brunette and I've put on about five pounds." The photo he'd posted was supposedly from his modeling days; it showed a wiry blonde wearing Fruit of the Looms. "Don't worry about it," I assured him. The moment he hung up, I called Holly and repeated the conversation to her. "What a woman!" she exclaimed. "Keep me posted." Eric, when he arrived—he'd promised five minutes but had taken thirty—might have been the guy in the photo, but if so it had been minus fifty pounds and plus a bottle of bleach ago. Still, we hugged and Eric announced I should follow him to his house. He started back to his car, then turned and said, "Oh, I should mention—I'm married. And I haven't, you know, told my wife about me being gay or anything." By now, nothing Eric said could surprise me. "No problem," I said, and got into my Toyota. Eric's house was in a fairly new housing development in which most of the homes were still in a state of construction. Eric opened the door, saying, "Don't mind the dog," just as I spotted his wife standing just within. She was several inches taller than Eric, had jet black hair, and I mean jet black, so black it had no highlights, brushed so severely that not one strand was out of place. Her eyes were also dark and penetrating, her skin pale, and she wore a severe black business suit and matte black shoes with stiletto heels. 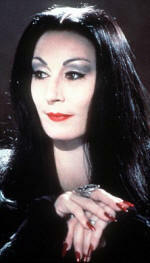 She reminded me of Morticia Addams. "This is my wife, Linda," Eric introduced. Linda tried to smile in greeting but the best she could manage was a grimace. "It's nice to meet you," she said. For some reason I was mildly surprised she didn't have a thick German accent. There was a dog, other than Eric's wife; a little yapping poodle who barked incessantly, hiding beneath an easy chair to do it. Eric kept telling the creature to shut up, but the dog ignored him. Finally Linda glared at the beast—said nothing, just stared—and the animal tore from the room in terror, its puffy tail between its legs. "I'm sure you'll want to see where all the action is," Eric said. I wasn't sure I did, but I followed him to a spare room. It contained three desks and at least three full-sized computers and monitors, along with a couple of printers and a device I'd never seen before. Eric caught me looking at it. "That's a flatbed scanner," he explained proudly, lifting the cover. There was a photograph, upside down, on the platen. I picked it up, turned it over, and was surprised to see it was the photo reproduced above, of the alien at the power plant. "I recognize this," I said. "Isn't this the Polaroid Danny took?" "Yeah," Eric agreed, after hesitating just a fraction of a second. "He sent them to me to scan for him." But Danny's the one who posted them, I thought. From Massachusetts. Three days ago. The morning after he took them, according to his story. My internal alarm bells were ringing, but I said nothing. Eric might have a perfectly sensible explanation; but I would have no way of knowing whether it was true or merely convincing. At the conclusion of my visit, Eric and Linda invited me to spend the night. It was after 11 pm; but frankly being there gave me the creeps so I told them I had a lot of miles to make before morning. Eric walked me to my car, and embraced me in farewell. Then, suddenly, he planted his mouth on mine and tried to jam his tongue past my tonsils. I recoiled, and he apologized. "I'm so sorry," he said. "It's just been so long since I've been with a man." Having met his wife, I wasn't so sure. So I drove through the night, reached my destination, and taught the scheduled class without a hitch. A few months later, I was back in Manchester when Holly called me. "Where were you last night?" she asked. 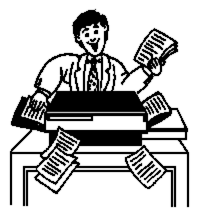 "I had to finish an article by deadline. Why?" "Sylvia committed suicide while online!" "She said she couldn't take the abductions any more and she was going to kill herself. Then she just stopped typing." "Holly," I said, pointing out the obvious, "that's not really proof. Was anyone with her?" "No, she lived alone. But Eric called the police." About this point, I began to notice movement in the room. 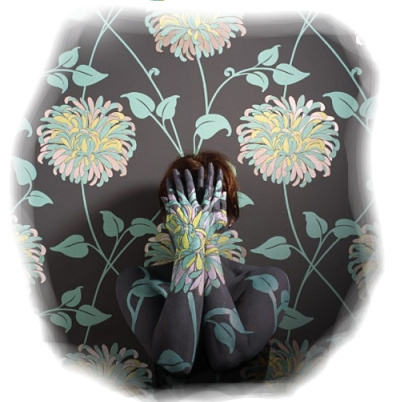 I was alone in my townhouse; the windows were closed. Yet something at the corner of my eye had shifted. I ignored it as being unimportant. Holly continued, explaining that Eric, Danny, Sylvia, a couple of others, and she had been chatting when Sylvia typed her intent to harm herself. Holly found herself doing most of the counseling work, urging Sylvia to seek guidance, to dial 911, that surely things would look brighter tomorrow. Sylvia said she'd already taken "the pills" and, indeed, her spelling and grammar were already beginning to suffer. Holly didn't know exactly where Sylvia lived or even her last name, so she couldn't call for help herself. "I did," Holly assured me. "But she wouldn't say." "But Eric knows where she lives," I pointed out. "He has access to everyone's registration records. Did he call for help?" The movements, flickering about the room, were maddening. Something would move just beyond my range of vision, but when I turned to see what it was, there'd be nothing out of place. I've had this experience before—I think everyone has—but never to this extreme. "There are some kind of light-bending effects going on around me," Holly suddenly announced. "It's driving me crazy." "Light bending?" I asked. "You mean, like something moving just beyond your sight?" "Yes! Are you getting that, too?" "I am," I agreed. "Could it be some kind of alien manifestation?" But neither of us could answer that, so we returned to the topic at hand. And, suddenly, the image popped into my head of Danny's alien photograph on Eric's desk. "Eric, Danny and Sylvia are usually online at the same time, aren't they?" Holly thought. "Yes, usually. I think. Of course, so are you and I." "That's true," I admitted. "But…I have a weird hunch. Just hang on a moment. I'm going to switch to my office phone." I put her on hold, ran upstairs and picked up the extension. "Now give me a moment to log in." "You're logging in to CompuServe?" she asked. "Right. There's a record of each member's last log in. As leader of the Support Group, I can look at it. I want to see where Sylvia lives." "But you can't get to that record," Holly protested. 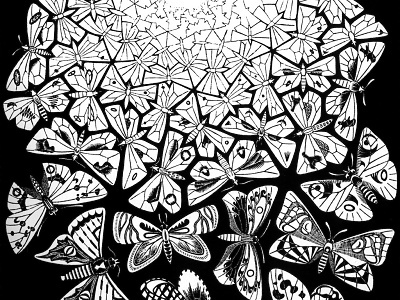 The flickering had gone upstairs with me, like a thousand invisible butterflies fluttering around my head. "True, but I can look up which CompuServe location she dialed in to," I explained. "By area code and exchange. Most people dial local numbers, so that'll at least narrow it down." As I waited for my own connection, I added, "I'm pretty sure she once said she lived in Ohio." When the whistle-and-whine of the modem had stopped, I typed in the command and read the CompuServe number she'd last connected through. Sure enough, the call had been made the previous evening. I grabbed my phone book and turned to the area code map. "This flickering around me is insane!" Holly declared. "Nothing is moving, but it's like the air is jumping!" "Wow," I said. "Same here, but listen to this. Sylvia's area code isn't in Ohio at all. You'll never guess where she lives—or, at least, connected through." I took a deep breath for dramatic effect. "North Carolina." I checked another entry, then another. "The same exchange, in fact, that Eric dialed. And…the same as Danny!" "All three of them live in North Carolina?" "Did I mention to you," I said, "that Eric has three computers in his house?" There was a lengthy pause on the line, as the air fluttered and danced around me. "But Eric called the police," Holly reminded me. "And you know that because…?" I could hear Holly sigh over the phone. "Because Eric said he did. Eric is Sylvia," she whispered in realization. "And Danny." The flickering suddenly stopped. The air returned to normal. "Hey, that light-bending has stopped!" Holly declared. "For me, too," I told her. "What do you suppose it means?" "I don't know," she said. "But I think we've just discovered something very significant about the Encounters forum." "You mean like we have some weird guy for our SysOp?" "Remember, the CIA infiltrated CUFON until there were no civilians left in it," Holly reminded me. The story was a classic among UFO buffs. The non-CIA folk had started a new organization, MUFON, which I suspected had itself become infiltrated with someone whose job it was to prevent real abduction information from being taken seriously. "You think Eric's in the CIA?" I challenged. "I think he's too weird to be in the CIA." "I'm not saying anything. Just keep an open mind." I tried to do that. "There's those photos of the alien that 'Danny' is supposed to have taken. If there is no Danny, Eric must have taken them. But why would he try to hide where they came from?" There was a pause, then I answered my own question. "What if they're faked?" I asked. "If everyone got excited about them and they were proven to be fakes…would that make any of us doubt our experiences?" "Probably not, dear," Holly guessed. "But it might make others doubt our experiences. More than they already do, I mean." "You know, it's weird," I said, "but every since I saw Danny's photo in Eric's computer room, neither he nor 'Danny' has said anything about it. Like would happen if it had failed its purpose." "So now, the only mystery is, what was that flickering we experienced?" That mystery remained unsolved for several years, until I read The Celestine Prophecy. In it, author James Redfield explained that, when we are trying to solve a tough but important problem, one whose solution will impact us for the rest of our lives, "soul fragments" of our greater selves will gather to give us additional—well, call it "energy" to help us derive the optimal solution. He explained further that these soul fragments appear as "flickering" in the air. I have no idea how different my life, or Holly's, might have been if we hadn't figured out Eric's scam. But after saying goodbye to Holly, I immediately called Eric. Without directly accusing him of anything, I merely pointed out that I had looked up his, Danny's, and Sylvia's connection records for the previous evening, and that he himself had shown me his several computers. "A person with several phone lines could easily pretend to be several different people at once with a setup like that," I remarked. "I thought you should know…that I know." Nothing more was ever said of Sylvia; Danny never made another appearance, and the alien photos were quietly removed from the downloads section. Fortunately, I had kept copies.